American Canco Model 006, automatic, single head, atmospheric, can seamer rated from 5 to 45 containers per minute – depending on materials, application and machine configuration. Can size range: 202 to 404 in Diameter x 214 to 510 in Height (with proper change parts). Equipped with (4) roll, double seam, single seaming head, 16" high can lid magazine, 32" long lugged chain feed conveyor set on 7" centers, with 17" accumulation disc, hand crank adjustable and 3 Hp motor chain to sprocket drive with safety guarding. Mounted on 32" x 36" cast iron base frame with leveling screws. Currently set for 401 can. 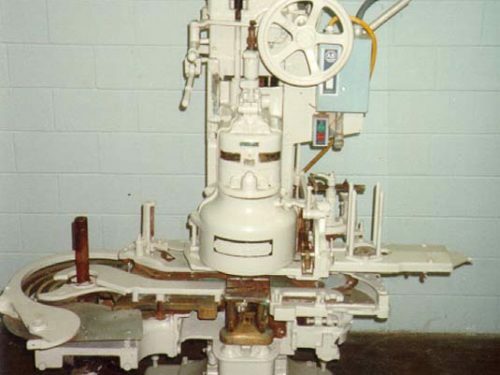 American Canco Model 008, automatic, single head, atmospheric, can seamer rated from 5 to 40 containers per minute – depending on materials, application and machine configuration. Can size range: 307 to 603 in Diameter x 208 to 900 in Height (with proper change parts). Equipped with (4) roll, double seam, single seaming head, 6" high can lid magazine, 32" long lugged chain feed conveyor set on 11" centers, with 21" accumulation disc, hand crank adjustable and 3 Hp motor chain to sprocket drive with safety guarding and can counter. Mounted on 34" x 36" cast iron base frame with leveling screws. Currently set for 603 can. 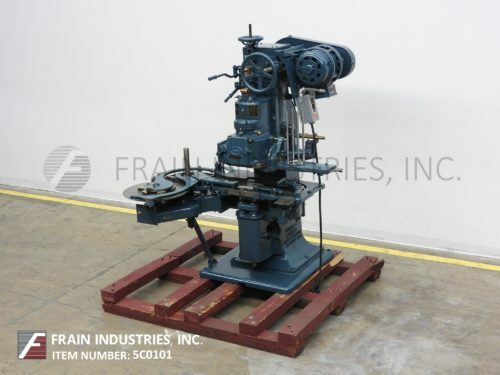 American Canco Model 006, automatic, single head, atmospheric, can seamer rated from 5 to 45 containers per minute – depending on materials, application and machine configuration. Can size range: 202 to 404 in Diameter x 214 to 510 in Height (with proper change parts). Equipped with (4) roll, double seam, single seaming head, 32" high can lid magazine, 32" long lugged chain feed conveyor set on 6" centers, with 18" accumulation disc, hand crank adjustable and 3 Hp motor chain to sprocket drive with safety guarding. Mounted on 32" x 34" cast iron base frame with leveling screws. Currently set for 211 can. Canco Model 108A, semi-automatic single spindle can seamer rated from 5 to 10 cans per minute – depending on materials, application and operator dexterity. Foot pedal operated. Can size:106 To 700 in Diameter, 300 to 1008 in Height. Mounted on heavy duty base frame with casters. Currently set for 603 x 700, #10 Can. Canco 422IE00 or 006, Automatic single spindle can seamer capable of speeds 10 to 90 cpm (depending on application). Atmospheric seamer has a can size range of: (202 – 404 Dia) x (113 – 604 H) with proper change parts. Currently set for a 307 diameter can. Equipped with no can / no cover detector, (4) Roll seaming head. 16" high lid magazine, and lugged star Infeed / discharged chain conveyor. Canco 08, Atmospheric fully automatic single spindle can closing machine capable of sealing 40 cans per minute depending on can size. Machine is able to accept cans from 307 – 603 diameter x 214 – 900 in height with proper change parts. Unit equipped w/disc to star wheel in feed, automatic lid feed, can marker and no can no cover detector. Unit currently set for 307 diameter cans. Last run in coffee filling operation. Change parts to run 401 diameter cans are available at an additional cost. Canco 08VAC, automatic, single head, vacuum can seamer rated from 10 to 30 cans per minute – depending on materials and application. Can size range: 307 to 603 in Diameter; 214 to 700 in Height (900 with lift kit) and proper change parts per application. Equipped with disc to star wheel infeed, no-can / no-lid, four roll, double seam, single seaming head and vacuum chamber. Additionally features: rapid height adjustment and controller with start, stop, reset buttons. Mounted on heavy duty cast iron base frame. Currently set up for 603 diameter can. Canco Model 117GVAC, automatic, single head, vacuum can seamer rated from 10 to 100 cans per minute – depending on materials and application and size drive. Can size range: 200 to 502 in Diameter x 210 to 700 in Height (requires proper change parts) Equipped with disc to star wheel in feed, (4) head product topper, no-can / no-lid, emboss coder, four roll, double seam single seaming head and vacuum chamber Additionally features: rapid height adjustment, control panel with start, stop, reset buttons and jog / run switch. Mounted on cast iron base frame. Currently set up for a 502 diameter can. Canco 422IE00 or 006, Automatic, single head, can seamer 10 to 90 cans per minute – depending on materials and application. Can size: 202 to 404 in Diameter; 113 to 604 in Height. Equipped with disk to star wheel infeed, lugged chain conveyor, no can/no lid, four roll seaming head,16" lid magazine, A/B start/stop. Canco 08, Automatic Atmospheric Single Head Can Sealer Capable Of 10 to 40 Cans Per Minute. Unit Is Set For 603 Diameter Can And Height Is Adjustable. With Proper Change Parts Unit Has Can Size Range: (Diameter) 307 – 603 (Height) 214 – 900. Complete With No Can/No Cover Detector And Cover Embossing Marker available at additional $2,500. Unit Has A Star To Lugged Chain Infeed. Canco 08, Fully Automatic Atmospheric Single Head Can Sealer Capable Of 10 To 40 Cans Per Minute. Unit Is Set For 404 Diameter Can And Height Is Adjustable. With Proper Change Parts Unit Has Can Size Range: (Diameter) 307 – 603 (Height) 214 – 900. Complete With No Can/No Cover Detector And Cover Embossing Marker. Unit Has A Star To Lugged Chain Infeed. This Is A Double Seaming Machine.